Prologue: Moon Magic | Ledia Runnels' "World of Fantasy Fiction"
On the summit of Moon Mountain, the last fire-shards of sunlight glistened against the remnants of spring snow. Dusting the ground and the upturned roof of the shelter whereHinata Jintori stepped beneath, into the narrow space. A frozen wind blew the hem and sleeves of his robe as he broke the skin of ice that covered the stone basin. Scooping the chilled water, he drew his cupped hands toward his lips where he sipped and then rinsed his mouth of impurities. He spat the warmed water onto the ground and then shook loose the freezing droplets from his fingertips. 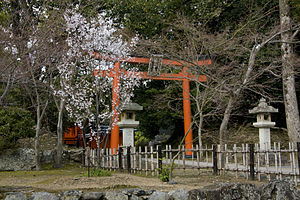 Having completed the purifying ritual, he turned and made his way toward Sakura Jinja, a smallish shelter, enclosed by four walls that stood a few short steps away. Into the narrow entryway of the Cherry Shine, the outer sanctum, he crossed. A few steps beyond, he moved into the heart of the holy place. Only the rasping shuffle of his sandals against the wooden floor and the sound of his breathing broke the silence of approaching twilight.